The appearance is deceptive. The district headquarters of Bellary in Karnataka could be any other small town in India: rows of tiled houses, potholed lanes, a bustling marketplace with dingy eateries and unruly traffic. There is little to indicate that Bellary has, over the past decade, metamorphosed into India's hot spot showing an amazing convergence of politics, business and crime. Reason: earth rich in iron ore. The area is semi-arid with patches of green. The air, water and soil are distinctly red—dig up a mound in the right patch and the chances are two-thirds of it would be iron ore. From 2002-2003 onwards, as demand for iron ore from China rose, never-ending lines of trucks would each day transport iron ore from Bellary and the adjoining districts of Tumkur, Chitradurga (in Karnataka) and Ananthapur (in Andhra Pradesh) to ports along the south-western and south-eastern coasts. 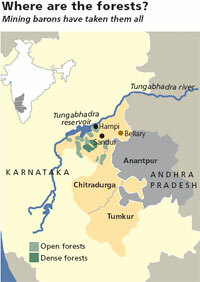 The Bellary region contributes roughly a fifth of the iron ore extracted in India. Not long ago, only iron ore lumps were exported, but with the advancement of steel-making technology, the demand for iron ore fines from India grew exponentially. The infrastructure projects commissioned in the run up to the 2008 Beijing Olympics fuelled an unprecedented hunger for steel; prices of iron ore soared from around Rs 1,200 per tonne in 2002 to around Rs 6,000 per tonne in 2006-2007. The quality of iron ore found in Bellary is one of the finest in the world, with an iron content of 60-65 per cent, known as 64Fe. This ore is exported to countries like China and Japan where it is converted into pig iron and then steel. The demand for the fine ore spurred illegal mining. Officially, Bellary has 58 operational mines. But 12,000 instances of illegal mining have been detected since 2000. 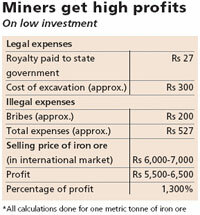 According to one conservative estimate, illegal mining in the region has cost the state government Rs 3,000 crore between 2004 and 2006 (See Also: Miners get high profits). Mining in and around Bellary district has led to lopsided human development. The district, which has a population of around two million, boasts a per capita income in excess of Rs 47,000, well above the average per capita income of Karnataka at Rs 41,000. But the literacy rate of Bellary at 57 per cent is well below the average literacy rate in the state at 67 per cent. Economic polarisation is stark. On one hand, the region has witnessed the growth of the nouveau riche class in a short time span: luxury carmaker Mercedes Benz sold at least 25 vehicles to mining tycoons in Bellary between 2008 and 2009. On the other hand, are the majority who still live in poverty. The Karnataka Human Development Report of 2005 ranked Bellary 18th among 27 districts (Read Report). It ranked the district the lowest in terms of social indicators such as literacy, health and access to drinking water. The report said though the district ranks 9th in terms of income, "higher income does not automatically translate into improved literacy and health status for the people if that income is not equally distributed". Mining has also affected employment patterns. Earlier, agriculture used to be the primary occupation of people. Now many farmers have leased their land for mining iron ore. Women are engaged in mining in large numbers. They work long hours in poor work conditions for wages far lower than what men get. 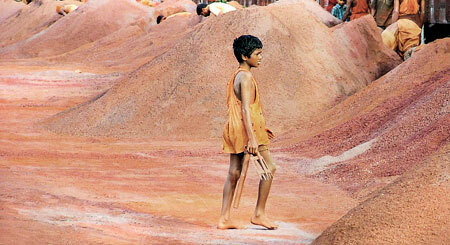 Children are engaged in activities like hammering, crushing and filling boxes with iron ore, again at low wages (See CSE Report: 'Rich lands, poor people'). Journalist and documentary filmmaker Nupur Basu, who, in 2005, was among the first to report rampant child labour in Bellary, said, "Children as young as three years were engaged in surface mining. They were mostly children displaced by droughts.It's a classic case of profits versus people." The dust hanging over Bellary is a health hazard. The area has high incidence of lung infections, heart ailments and cancer, said doctors working in Bellary. Leo F Saldanha of the Environment Support Group, a trust in Bengaluru working with communities, said, "When hundreds of trucks roll through the region each day, the dust they kick up reduce people into walking skeletons. The malnutrition is a combination of not having the means to earn a living and pollution". The trucks pose another threat. "Over 500 people have died and many were injured due to rash driving in recent years. Victims and their families have not been compensated. There is hue and cry in the port town of Nelluru over this." said B V Raghavulu, CPI(M) secretary in Andhra Pradesh. Mining has affected forest areas, including the reserved forests in Bellary and Vyasankere. Mining barons have exploited loopholes in the rulebook to divert forestland for mining. According to the Forest Conservation Act, the divisional forest officer (DFO) is the key person for deciding if forestland can be diverted for non-forest activities. The mining barons have bribed, coerced or threatened all DFOs posted in mineralrich forestland into submission. "The Ministry of Environment and Forests has been rubber-stamping clearances granted by DFOs. Even Jairam Ramesh, Union minister of state for environment, has said it on record that the 95 per cent clearance rate for such projects is unhealthy," said Saldanha. Dumping waste material has eroded the topsoil in the region. Species of wildlife, such as the Egyptian vulture, yellow throated bulbul, white backed vulture and four-horned antelopes, vanished as forest cover depleted. Rainwater that flows down hillocks and replenishes water aquifers now picks dust along the way, contaminating water and degrading soil, affecting farming. Studies point towards a fast rate of siltation in the Tungabhadra reservoir due to mining waste. A 2005 study by the Jagratha Nayaka Balaga, a non-profit in Bellary, said the total capacity of the reservoir had decreased from about 133 thousand million cubic metres (TMC) to 99 TMC in recent years. The resilience of the people in the region—whose lives was once ensconced in nature—seems to be eroding due to environmental degradation caused by mining. Karnataka Lokayukta N Santosh Hegde, who is probing illegal mining in the region (see: Politics of mining), said some 40 people came to him crying during one of his field visits. They complained, "Why don't they give us poison instead of making us suffer by breathing and eating this mineral dust?" Saldanha is optimistic that peoples' movements would bring about a radical political change. He says the Dalit sangharsha samitis (organisations fighting for lower-castes), which had broken in factions, are now coalescing. Some of the affected farmers have woken up to the problem and rayyat sanghas (farmers' associations) had protested in Bengaluru. "Convergence of Dalits' and farmers' politics may change the nature of politics and power equation in the region," he said. Others are less optimistic. Bellary has so far not witnessed left-wing extremism. That day may not be far. 'Profits kill' is a time tested old adage proved beyond doubt, but the the speed for greed in Karnataka is beyond anybody's imagination, it is a damning expose of the claims of the mining barons that they have been "developing" the state. When people go to the ombudsman (Lokayukta) of the state, asking for poison to relieve them from the option of "living" in this hell, that is something that these "development" specialists should be ashamed of. Be it the MNC's or the home-grown Reddy brothers, they have only one mantra, exploit everything for profit. No matter what the consequences are, be it health, environment or the society itself. This begs our attention to the fundamental questions of 'What kind of industrialisation and development should we have'? and under whose control and management. We must find alternatives that put people and environment before the bloody profits.